CENCERE is an innovative approach to energy research and education. Committed to the development of clean, sustainable energy sources, CENCERE partners with a cross-disciplinary team engaged in catalyzing new initiatives in energy research and education. Within the 5000 plus square foot CENCERE facility, students conduct hands-on research on sources suitable for renewable energy development. An infrastructure to create and provide opportunities for faculty, students and staff engaged in the study of clean energy. To contribute to the operation of the Renewable Energy Center as it supplies energy to the campus. 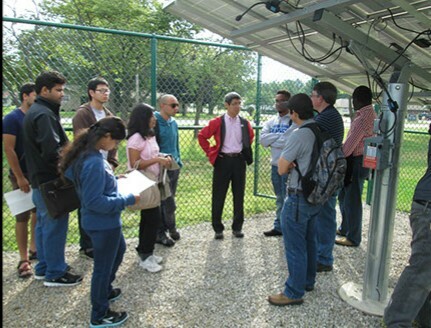 To facilitate collaborative research in renewable energy by faculty across the entire university. To enable students to study clean energy in order to be knowledgeable in environmental protection, natural resource preservation, and social responsibilities and solutions. To become a national leader in clean energy research and education. Focus Area of Study in Alternative Energy and Sustainability - Undergraduate coursework includes study in the basics of energy sources and technology, the specifics of alternative and renewable energy and their uses, the sustainability of energy sources both traditional, alternative and renewable, and examining the trends both present and future as to energy sources, energy usage, and energy futures. Interdisciplinary Undergraduate Minor on Environmental Sustainability - This minor provides students with the skill set needed to be competitive in a job market focused on the applications of environmental sustainability. Students will take courses in alternative energies and sustainability as well as biogeochemical aspects of environmental sustainability. The minor also provides examples of the applications of environmental sustainability to various social systems. Existing prerequisites for courses must be satisfied. Masters of Science in Sustainable Energy - Masters of Science in Sustainable Energy graduate degree program focuses on preparing leaders and managers for the entire energy industry. This multi-disciplinary degree is science based and technology management focused.The purpose of the this graduate degree program is to empower students to develop advanced knowledge and skills in order to become leaders and managers in the energy sector.